Laura Lancing: If you remember, Mr. Brittas, you told the ambulance men to come round to the back in future. You thought it was better for morale. Gavin Featherly: I've just seen Larry Whittaker. He says he's going to kill Brittas. Tim Whistler: I've always liked Larry. Gordon Brittas: It is seven years to the day since the first member of the public walked through those doors. 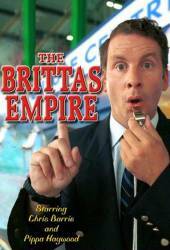 Gavin Featherly: And you threw him out, Mr. Brittas. Gordon Brittas: He was wearing unauthorised water wings, Gavin.